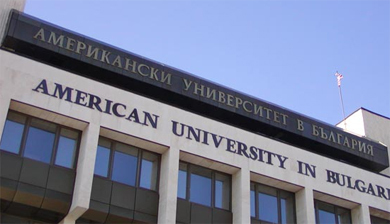 The American University in Bulgaria (AUBG) is an international institution of higher education committed to democratic values and founded on the traditions of academic independence and freedom of inquiry and expression. It is a Bulgarian and American joint initiative, private, highly selective, residential undergraduate institution. The curriculum is designed to foster independence of thought, creative problem solving, and effective communication. Students can pursue majors in nine (9) disciplines -- economics, business administration, computer science, history, journalism and mass communications, political science and international relations, European studies, mathematics, and Southeast European studies. English is the language of instruction. The faculty is international with a majority of its members United States citizens. The mission of AUBG is to educate future leaders committed to serving the needs of the region by promoting the values of an open, democratic society. This education, in the best traditions of the American liberal arts, instills the values of democracy and individual liberty, free market economies, and a free and ordered civil society. It encourages and develops individual initiative, critical thinking and problem solving skills, as well as a respect for the rule of law and the importance of personal responsibility. AUBG's major achievements are best expressed by the quality, composition, and achievements of the student body. The University attracts the best and the brightest. The incoming class for September 2004 boasts an average SAT score (taken in a second language) of 1220 and an average TOEFL of 635. The average scores rank with the most selective colleges and universities in the U.S. and Europe. The University has expanded its mission to serve the Southeast European region and currently provides educational opportunities to 850 students from 24 different countries. The success of the AUBG graduates is undeniable. Our graduates number over 1400 -- future leaders for Bulgaria and the other countries of Central and Eastern Europe. They have the education and skills needed to assure orderly political and economic transition in this historically troubled region. 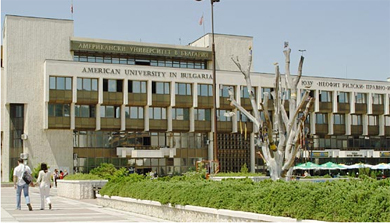 Approximately 30% of AUBG graduates continue their studies in the U.S. and Europe. They are accepted to the most prestigious universities. Others enter the labor market seeking employment in the private sector, NGOs, and government. Many AUBG graduates have started their own successful small businesses. 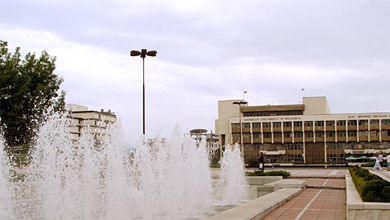 AUBG has established itself as a legitimate and highly valued institution in Bulgarian higher education with a degree recognized by the Bulgarian government. It is accredited by the New England Association of Schools and Colleges (NEASC) in the United States, and by the Agency for Accreditation and Evaluation in Bulgaria. AUBG is incorporated in the State of Maine, as a 501 ©(3) tax-exempt organization under the U.S. Internal Revenue Code. The scholarship recipients will be selected on a competitive basis from a candidate pool of AUBG students seeking and qualified for financial assistance in AY2004-2005. The awards will be for a period of four years. This will allow the scholarship recipients to complete a full, four-year course of study ending in a Bachelor of Arts degree. Student's will be required to maintain a 3.0 grade average on a 4.0 scale to continue to qualify for the award. Also, students will be expected to display behavior and personal qualities that exemplify the high standards and qualities supported by the Nando Peretti Foundation. The Nando Peretti Foundation provided funds for Academic Year 2004 - 2005 thru Academic Year 2007-2008.